Balkan Vagabondz invites you to one of the most popular treks on the Balkan Peninsula, “The 7 Rila Lakes & Monastery Adventure”. Join us on a truly unforgettable hike in one of the most pristine mountains of the Balkan region – Rila. Explore more than 200-year-old forests with trees up to 50m. Enjoy the stunning glacial lakes formed during the Ice Age along with a 70m tall waterfall. 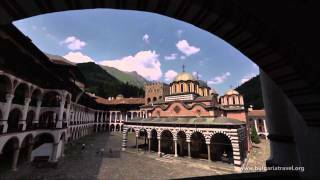 Visit the most significant cultural symbol of Bulgaria – Rila Monastery. Balkan Vagabondz welcomes you into the natural and spiritual soul of the Bulgarian people – Rila Monastery and the 7 Rila Lakes. This is a challenging hike which requires hiking experience, fitness, and proper gear. Prepare for a two-day trek with incredible views on the way and overnight stay in a high mountain hut. ~ Day 1 ~ Sofia – Zeleni Preslop – Skakavitsa Hut – Skakvitsa Waterfall – The Seven Rila Lakes – Ivan Vazov Hut – 9 hours, +1200 m/-500 m.
~ Day 2 ~ Ivan Vazov Hut – Rila Monastery – Sofia – 6 hours, +200/-1350 m.
A minimum experience in similar treks is required – we need to be sure that you are able to walk on mountain terrain around 9h with medium pace and climb +1000 m, carrying your gear. We follow only marked tourist trails and there are no terrain difficulties however a decent physical fitness is a must. We are also able organise private transfers from Sofia in order to save time and hassle with public transport. The total cost for these is 320 BGN (160€ total for up to 3 people in a car). – Mountain hut accommodation – 35BGN (17€/person) – includes accommodation, dinner, breakfast and packed lunch for the next day. Not included. Can be organised upon request.